This is quite a large album of recent corporate photographs, really just to give a sense of the range of styles and settings that can arise. What works for an investment bank probably won't convey what an independent record company is all about. Likewise, an international marketing division will have a different sense of identity from a Czech classical concert promoter. Budgets differ; intended usage varies. I hope this selection broadens the scope of how 'corporate' photography is imagined to be, and inspires you to find the ideal style to suit your own enterprise. I know that sounds a really naff title for this small introduction to a couple of recent photoshoots, but it is actually relevent. When I were a lad, occasionally there’d be a fair. All I can remember about it is that I never went on any of the rides, there was always dodgy food, sticky sweets, and..... bloody thousands of wasps. I’m actually allergic to the little bastards now (is there a point to wasps? anyone...? anyone......?) and so is Katerina, the star of the shoot. Which made for some interesting moments, much flailing around and one or two continuity problems as she ran around, sticky lolly in hand. Naturally she put her beer down next to me, just so I wouldn’t remain a bystander. Pretty soon I was running around flailing and squeaking like a girl too. When I found a wasp on the other side of the fishburger (did I mention the food?) that my teeth were currently stuck in, I called it a day and left the meal on the table. When the hornet came out of the woods and settled on the beer, I felt it was time to leave the table completely. Oh, are we shooting again? How convenient. Actually though I say Katerina was the star of the shoot, she was given a good run for her money by her co-star. The strong, silent (plastic) type, I did the whole shoot without ever knowing his name. It's one of those things; after more than a few minutes, it’s actually too embarrassing to ask. Always note everyone’s name at the beginning of the shoot. What a dummy. Enough. The album of stills is on the left - ‘Matteo’s Shoot’. Just another classic tale of a woman and her man(ikin). To shoot or not to shoot...? Another afternoon morning. It took 1 tea, 2 coffees and an hour of hairy '80s rock to get me vaguely vertical even then. And I'm not claiming to be compos mentis even now. It was a beautiful weekend in the Moravian countryside. I was staying in a small village called Dolny Loucky near Tisnov, and feeling good. My body knew this was an authentic break, and decided to sleep as much as possible whatever else I might have been planning. That 'whatever else' consisted of trips to a medieval fayre at the local gothic castle, walks by the river and a trip out on the bike. And here we come to one of the fundamental issues of 'being a photographer': when do you put the cameral down and just get involved? But anyway - it did make me think: should I have just put the camera in the car, and said "hey, I'm at a medieval fayre. Pass me the mead"? The issue arose again the following day. We went cycling in the countryside. It's the first time I've been on a bike since my tendon injury, so I certainly didn't want to be carrying much. In fact, now that I think about it, it's the first time I've been cycling since my beautiful, beautiful pink racing bike got stolen in Cornwall (I know who nicked it, and I know roughly where he is... the time will come for retribution, oh yes....). So I left the camera at home this time, and, as you've probably guessed, the views were stunning. I mean, really, truly breathtaking. So there's that part of me looking at the wonders around me and thinking "damn, damn, damn, why didn't I bring a camera?" And then another part of me kicks in with "for goodness sake, just enjoy it! Be here! Be a tourist / cyclist for the afternoon. And have some more water before you pass out." 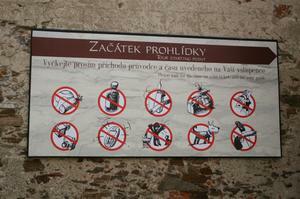 So I'd love to share scenes of the Moravian countryside with you, but I can't. You'll just have to imagine a cross between Sussex and Tuscany, and settle in the knowlege that I was truly there, and that I promise I'll take a camera next time. In the meantime here's a few shots that I did take - hope you like them. It's often tempting to visit the capital of another country and confuse it with the feel of the country itself; if you get a chance to visit the Czech Republic do see if you can get out into the countryside. It has a very different feel to Prague, and is truly wonderful. And remember to take a camera. So, Rob, my illustrious web designer says "people want to know a bit about the people they do business with, these days" and recommends I have a look at TypePad. Check it out, maybe get an account, and begin the process of uniting some of my images with some meaningful context. Or some such. Not that I'm complaining, you understand; just that I'm a little unprepared for how far it's all come, how integrated all the web systems are becoming, how extraordinarily complex the virtual world is becoming. And I promise I wasn't looking away for long; it only seemed like moments. But in those few moments I can see that a new aeon has begun. Maybe the information age is really here at last. So I really should embrace it fully. Trouble is, it does seem a bit big to get my arms (or my head) around fully. Almost oceanic. Perhaps a plunge is best. So if you're reading this, welcome to my site. Blog. Thing. Whatever. I'm going to keep all the photo stuff here and I'll link other blog pages to it so you can keep abreast of all the various developments in my complex (and so often complicated) life, and hopefully those of my friends and associates. If you can make any sense of it, do please let me know. I could do with a guiding hand. And there may be prizes! And do let me know if you have page of your own. This could be a rather good way of getting to meet and keep up with people. Right. Let's try uploading this and see if I've got any of this right so far....! Did I mention recently that I love film...? AngieBurton on Did I mention recently that I love film...? This is Jem's blog about his life and family, but with a focus on the experience of home educating. Do not adjust your screen; facepainting abounds. Becky is psychic. Which is nice. Her experience is a long as it is wide, and she now gives psychic development courses, which come highly recommended. Honest to God, if you like live music and utter insanity (Christmas in July springs to mind) this is the best pub you will ever find. It's... the real deal. Go to Tintagel. Have a drink. You know it makes sense. Renee is a spiritual coach and international actress, of great repute. She even has a gift shop. Hugh is out there with a kick arse band as well as the acoustic songs. If you want to feel the blood pump like it used to, get out there and see him. Looks, talent and youth. But enough about me; UXL have plenty going for them too. Classic rock. Damon and Tommy's band Sure - you can check out my 'featured guest drumming'! The best function band in the known universe. Really. Nadia practices EFT and Craniosacral Therapy, a powerful healing combination. I can't summarise it here - better to read her site! Rob's a great graphic designer, also jetting between Czechia and Britain. His is the passion that dare not spell its name: typography. Best not mention Helvetica. My brother Paul's a photographer in his own right - and we're not bad as a team, either. Here's his site. Janelle runs the best crystal shop and courses that I know of, and her online shop is, at last, online!